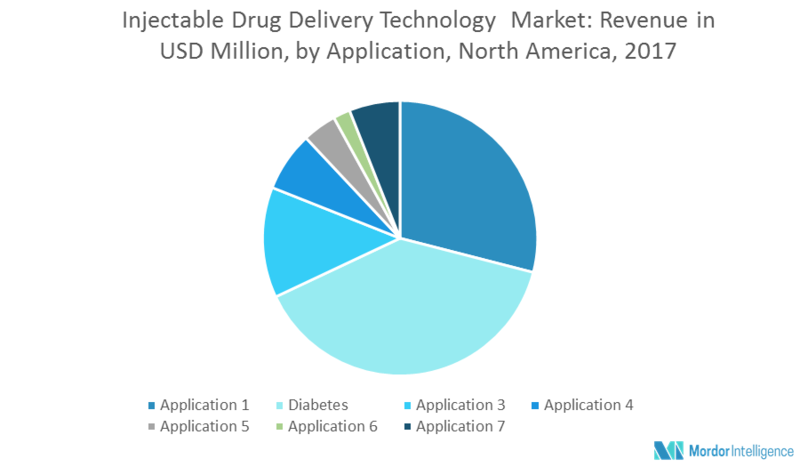 The North American injectable drug delivery technology market is expected to register a CAGR of over 13% during the forecast period of 2018–2023. Injectable drug delivery technologies allow the transport of drugs formulated in liquid form and facilitate the rapid transport of the drug into the body. It also helps in administering drugs in unconscious and comatose patients. These delivery systems are widely accepted due to their advantage of a faster onset of action with high efficacy. Also, in recent years, this market has grown due to the increased prevalence of cancer and diabetes. Some of the most common chronic diseases include heart disease, stroke, type 2 diabetes, obesity, cancer, and arthritis. According to the Center for Disease Control and Prevention (CDC), in the United States, seven of the top 10 causes of death in 2014 were chronic diseases. Cancer and heart disease together accounted for an approximate of 46% of all deaths. It was also reported that about half of the adults in the United States had one or more chronic conditions and one if four had more than two chronic conditions. Moreover, these numbers are expected to increase in the next 10 years. Since the adoption rate of injectable drug delivery devices is high among the population suffering from diseases like diabetes and heart-related disorders, the increasing prevalence of chronic diseases is expected to contribute to the growth of injectable drug delivery technology market in the forecast period. The benefits and convenience of the use of injections are also contributing to the growth of the market. Injuries and infections due to needles are acting as a major restraint for the global injectable drug delivery technology market. According to the Occupational Safety & Health Administration (OSHA) estimates, 5.6 million workers in the healthcare industry are at a risk of needle injuries. Moreover, there has been an increment in the infections caused by needles over the past few years. Therefore with the increasing injuries and the infections caused by needles, there is reluctance among people to use injections, hampering the growth of the injectable drug delivery technology market. The United States injectable drug delivery technology market held the largest market share in 2017 in North America due to the rising incidence of cardiovascular diseases, growing geriatric population, and the strong presence of industry players in that region. April 2017: BD (Becton, Dickinson, and Company) and C. R. Bard, Inc., entered into a definitive agreement. The major players include Antares Pharmaceutical Inc., Baxter International, Becton Dickinson and Company, Elcam Medical, Eli Lilly and Company, Unilife Corporation, and West Pharmaceutical Services Inc., among others. Follow the current and future North America injectable drug delivery technology market in the developed and emerging markets. 9.7 West Pharmaceutical Services Inc.